The Modernization of the Western World presents an overview of the history of Western civilization and provides readers with the intellectual tools they need to comprehend how societies function and change. Covering Western history from ancient history to the current era of globalization, it draws on the tradition of historical sociology to describe the forces of social change and what they have meant to the lives of the people caught in the midst of them. This second edition is revised throughout to bring the content up to date with recent developments and discusses key themes such as terrorism, refugees, the European Union and multinational corporations. It also includes a new chapter on the Ancient World, covering this era from the advent of urbanization and agriculture in the Middle East to the fall of Rome and emergence of Christianity, providing valuable historical context. 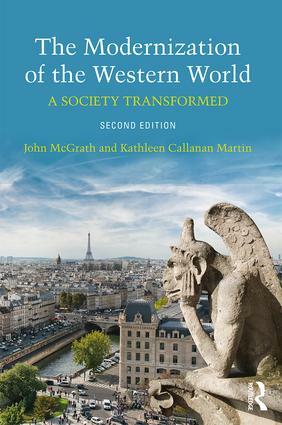 Clear and concise, this book succinctly illustrates the essential turning points in the history of Western society and identifies the economic, social, political and cultural forces that are transforming the wider world to this day. Illustrated with maps and images and containing a glossary and new boxed features explaining key concepts, this is the perfect introductory book for students of the development of Western civilization. John McGrath is Associate Professor of Social Sciences at Boston University, USA. His publications include The French in Early Florida: In the Eye of the Hurricane (2000). Kathleen Callanan Martin is Senior Lecturer of Social Sciences at Boston University, USA. Her publications include Hard and Unreal Advice: Mothers, Social Science and the Victorian Poverty Experts (2008).